If you are passionate about food and have a sense of adventure, I am sure you have a “recipes I want to try” list. If you are passionate about food, have a sense of humor and you are a food blogger then that list must be a mile long, at least, and it keeps growing with every new blog you follow and every cook book you add to your collection. If you were to read my list , you’d find that Gnocchi has been there for quite sometime. I wanted to give it a go so many times but somehow I never got around to it. That is why I was super excited when this month’s daring cooks challenge was announced. The challenge was to make potato gnocchi from scratch! 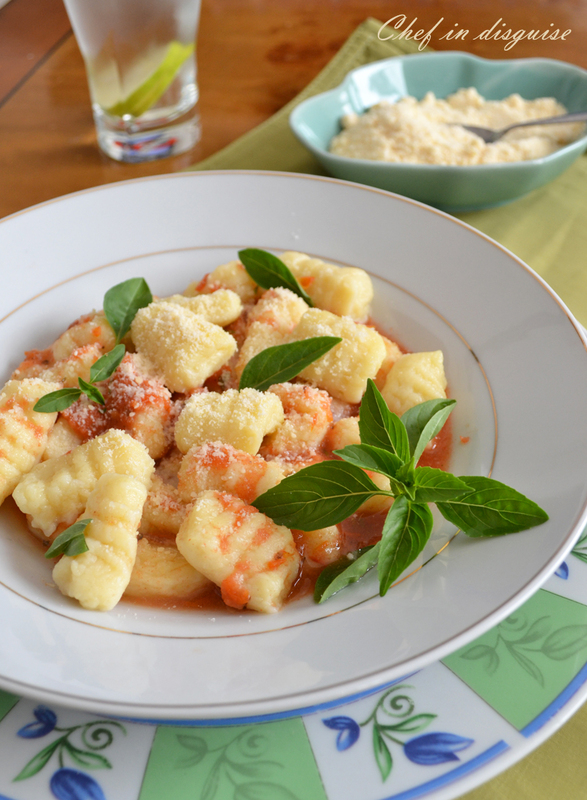 Gnocchi if you have never tried it before are Italian dumplings made of potatoes, flour and occasionally eggs. You can think of them as potatoes meet pasta to yield light and fluffy pillows that are simply irresistable . Blog checking lines: Todd, who is The Daring Kitchen’s AWESOME webmaster and an amazing cook, is our September Daring Cooks’ host! Todd challenged us to make light and fluffy potato Gnocchi and encouraged us to flavor the lil pillows of goodness and go wild with a sauce to top them with! Heat the oven to moderately hot 400°F/200°C/gas mark 6 and bake potatoes until tender, about an hour. You can also boil the potatoes with their skins on. When potatoes are cooked split the potatoes open to allow steam to escape. When potatoes are cool enough to handle, scoop out their flesh. On a well-floured board place the potatoes and form a well in the potatoes. 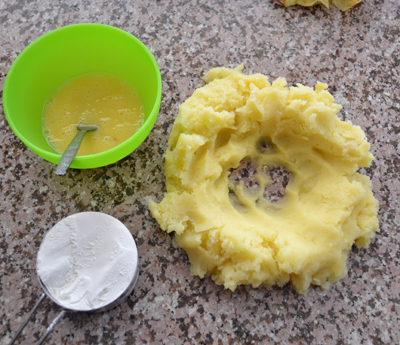 Put ¼ cup (60 ml) (35 gm) (1¼ oz) flour and the egg (if using) in the potatoes. Gently knead the potato, adding the additional flour if needed, just until the dough comes together. 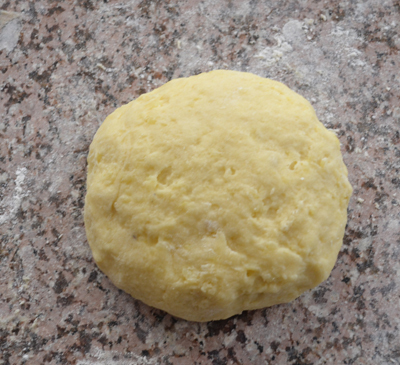 Pinch off a small piece of the dough and try cooking it in the boiling water to see if it holds together. If it does not add a little more flour and try again. 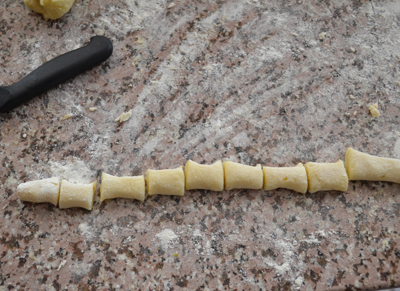 Roll each part of the dough into a rope, then cut the rope into pieces. Score each piece with a fork or gnocchi board. You can also just push your finger into it to form a little bowl. This is done to help the gnocchi hold onto the sauce a little better. Put the pieces onto a parchment lined baking sheet until ready to cook. 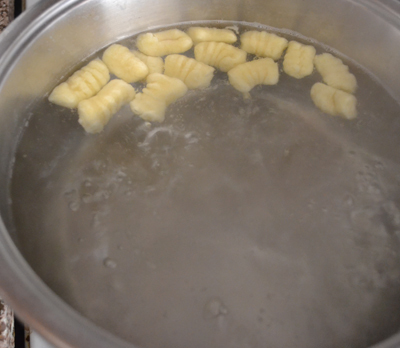 Add the gnocchi to the boiling water in small batches. When they are cooked through they will rise to the surface. After they rise to the surface let them cook another 60 seconds and remove them with a slotted spoon. Finish with any sauce you like. Cover it and cook for 15 to 20 minutes on a low flame, or until thickened. Place butter and sage into skillet over medium heat. Cook until the butter starts to brown and the sage is sizzling. Toss with gnocchi and plenty of Parmesan cheese. 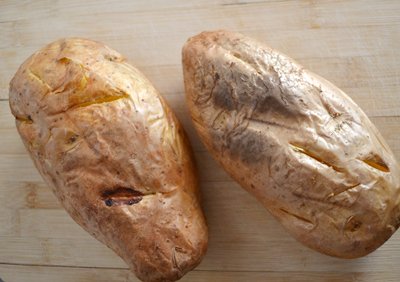 Storage & Freezing Instructions/Tips: You can keep the uncooked gnocchi on the counter for up to two hours. If you need to store your gnocchi longer they can be stored in the refrigerator for up to two days. Place them uncooked or cooked in a container in layers separated by parchment paper so they do not stick together. They can also be easily frozen. Place them on a cookie sheet to freeze. After they are frozen place them in a freezer safe container for up to six weeks. When cooking frozen gnocchi, cook in small batches. If the batch is too large the water temperature will go down and they will fall apart before they cook. Posted in Appetizer, Daring cooks, Vegetarian and tagged daring cooks, fluffy pillows, gnocchi, how to make gnocchi from scratch, how to roll gnocchi, italian dumplings, italian recipes, potatoes. Bookmark the permalink. Do you think these could be made with gluten free flour? I do know that mile long list very well indeed! 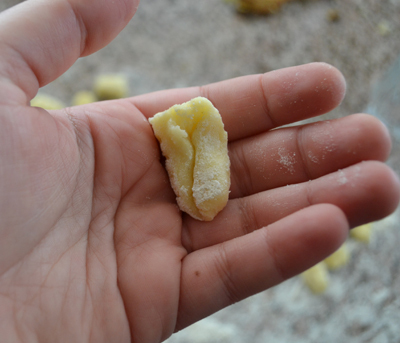 Making gnocchi was so much fun! Yours looks like it is being served in an Italian Canteen! Fantastic job! I still have to try John’s sauce. Your gnocchi came out beautifully! Thanks for your kind words. They look beautiful – glad you enjoyed the challenge! Gnocchi is one of my favourite dishes EVER! I had almost nothing else in Switzerland as the small Bistros there server their own edition of home made gnocchi with delicious sauces! I love making gnocchi. 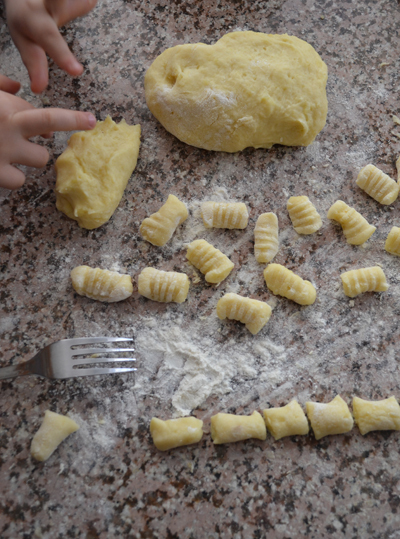 I was lucky enough to take part in gnocchi making at a restaurant – lovely to learn hands on with Italian mommas. I keep on saying ‘everywhere’ I do not eat potatoes, but have to admit to having had potato gnocchi for lunch today 🙂 ! You have made the proecess of creation extremely easy and your tomato sauce in its simplicity is sans pareil! Shall look further . . . 🙂 ! 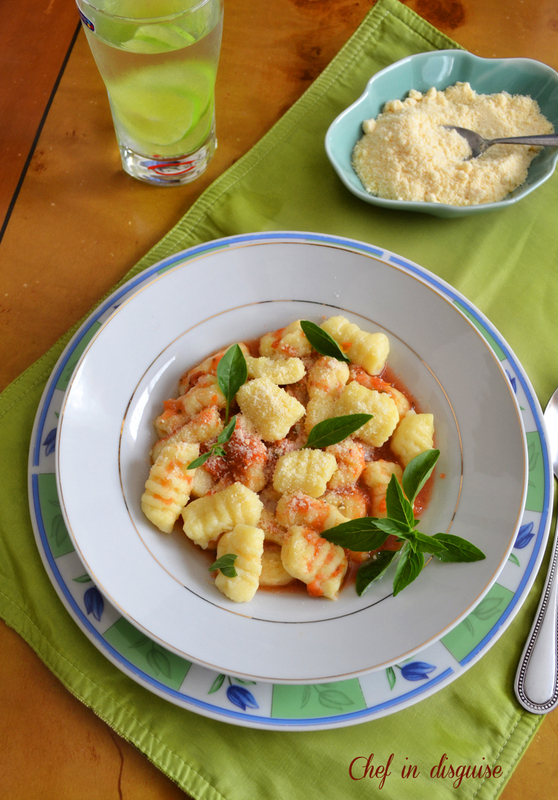 I took a class in Italian cooking recently and we made this.. it turned out to be a highight for me because the gnocchi were light and well, perfect. I need to try it at home but I haven’t done it yet! 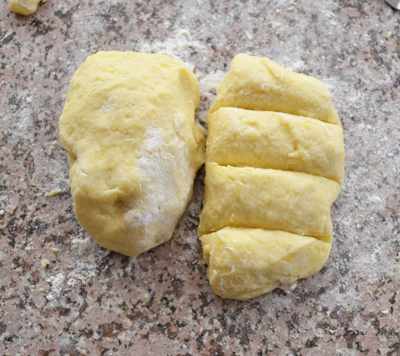 I have even conquered gluten-free gnocchi and just love working with the dough. They are always a hit. This is really the one type of pasta we allow ourselves from time to time. I adorea wellade gnocchi particularly with a good sauce like yours. Sawsan. Lovely photos, as usual. I watched the video and I am so glad I did. I have a gnocchi board but I didn’t realise you were supposed to flatten the little pieces until they curled, now I do. Thankyou so much. We make similar noodles in Austria with the potato dough. Because of our traditional dish we rarely go for gnocchi and if I am honest I forget that they exist. Thanks for sharing your recipe and for reminding me Sawsan. Hope you had a lovely weekend! Gnochi is wonderful stuff! I’ve made it before, but it’s been years and years. Yours looks terrific! Thanks for this. those look sooo good! I was (inactively) wondering about gnocchi and casually entertaining the possibility of attempting to make them, but your pictures and recipe have inspired me. thanks! 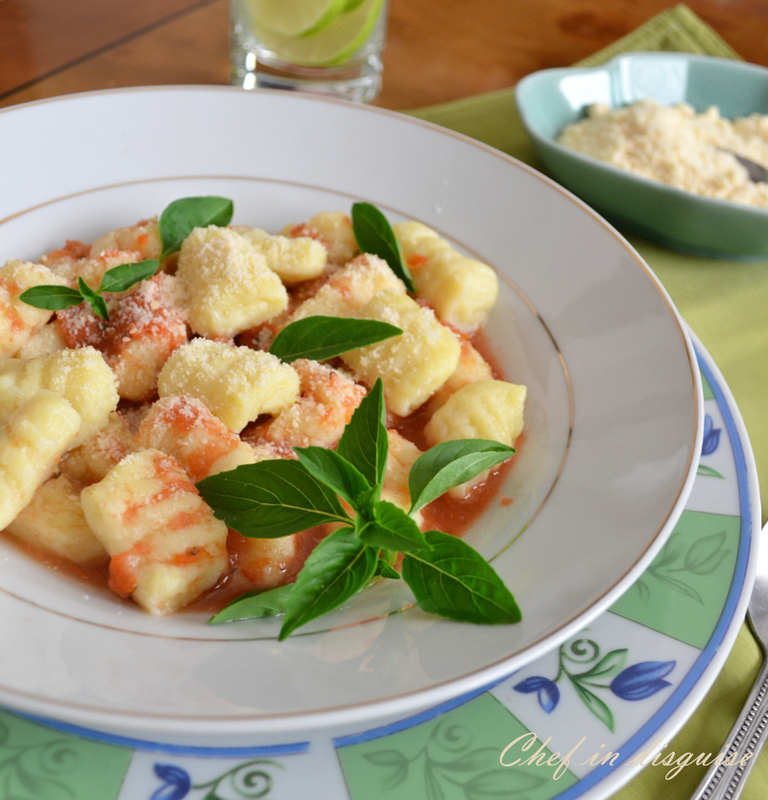 Perfect gnocchi, they look like the real Italian ones! Aah, now you see…putting one into the water to see if it holds together… that’s much too smart! My mother tried to make these once… boiled them all in one go and they all fell apart. It was “potato soup” for dinner that night, lol! It’s actually put me off making them myself, and that was even about 20 years ago. It’s something I have been meaning to try though… thanks for sharing Sawsan – they look wonderful, and perhaps will motivate me to overcome my “fear”. What a wonderful tutorial Sawsan! I’ve only made gnocchi once and I wasn’t entirely happy with the result. I do think I need to visit the recipe again though, perhaps with some help from the links you’ve added! Your gnocchi look perfect. Yum!!! This is easily one of our favorite pasta dishes. Mike does the gnocchi and I do the sauce. Now I am officially craving some! Beautiful photo and recipe Sawsan and congrats for completing the challenge too! Your blog always inspires me, true! Oh Sawsan, all my Italian aunties would be proud of gnocchi like these! They look amazing and my favourite way to eat them is with a delicious tomato sauce – fabulous post! This was a great challenge, wasn’t it? Gnocchi is one of my all time favorite foods but every time I’ve tried to make it myself I’ve failed! Mine either fall apart one I boil them or end up being really hard and tough. These look delicious, I might just have to give it one more try. One of the most delicious meals ever! I love homemade gnoochi… They are also great when made from whole wheat flour!